Sometimes the Oz Convention has some programming related to other books that are celebrating significant anniversaries in addition to the hundred-year one. 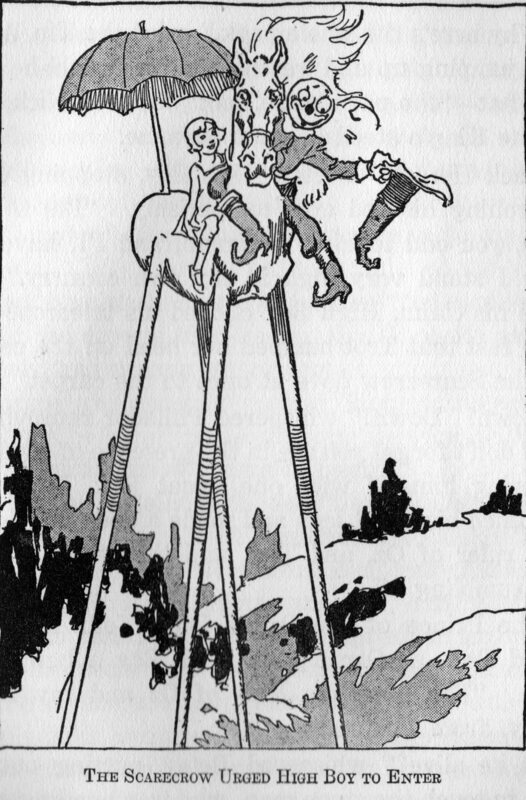 I don’t know if that’s the case this year, but I did use it as an excuse to revisit a book published ninety years ago, Ruth Plumly Thompson’s The Giant Horse of Oz. This is an important book as it provides Thompson’s solution for the Munchkin and Gillikin Countries not really having consistent rulers, while the Tin Woodman rules the Winkies and Glinda the Quadlings. It also largely sticks to the plot a little better than most of Thompson’s work, tying a lot of the story to the attempts to save the Ozure Isles from the monster Quiberon and restore their lost queen. At the same time, it’s difficult to identify a main protagonist (it certainly isn’t the titular horse), and the resolution is brought about by interference from Ozma and the Wizard of Oz rather than the characters solving their problems themselves. It’s an enjoyable read if you like Thompson’s breezy, whimsical style, although parts of it seem rushed. That said, it also starts with a lyrical description of the Ozure Isles instead of immediately getting into dialogue, often frantic or angry dialogue, as is more common for her. I’ll get into some more detail, and be forewarned that there are quite a few SPOILERS. Prince Philador’s main character trait seems to be charisma, in that everyone immediately likes him. He doesn’t change much over the course of the story, which is kind of par for the course in Oz stories, but perhaps not so much for Thompsonian princes. With her other ones, there tends to be somewhat of a coming-of-age narrative, if generally a light one: Pompadore and Tatters find brides, Reddy and Tandy win back their kingdoms, and Randy proves himself fit to rule a kingdom AND gets married. While she’s usually vague about characters’ ages, we know that Pompa is eighteen, and due to the nature of aging in Oz has lived at least nine years more than that. Randy starts as about ten but gets a little older. 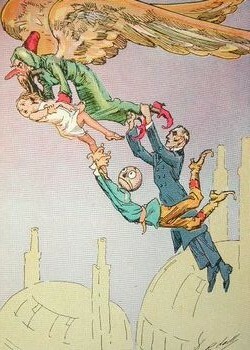 Philador, however, neither gets married nor inherits a throne; in fact, the whole goal is restoring his nuclear family. As such, there’s really no need for him to mature any more than there is for Trot, who also participates in this adventure; they’re both perpetually ten and like it that way. Phil’s father, King Cheeriobed, is also one of the kinder royal fathers we see. While Reddy and Randy’s dads abandon them, Tatters’ seems a bit distant, and Pompa’s is bad-tempered, Cheeriobed very much cares for his son. It’s interesting to me that March Laumer wrote Cheeriobed as an old duffer who has to change his entire personality to save his marriage, which seems to be based more on how John R. Neill draws the character than how Thompson shows him. Sure, he wouldn’t be a grown man in a Thompson book if he weren’t somewhat flustered and absent-minded, but he’s very kindly, willing to do what he can to help his kingdom and his family, and unwilling to see anyone get hurt. Also worthy of note is Akbad, the King’s court soothsayer, although he never actually does any soothsaying in the story. His name is a play on “Akbar,” and he speaks in flowery Arabian Nights sort of language, but I think the turban and long nose might have been Neill’s ideas. His main fault might be pragmatism in Oz. When Quiberon demands a mortal maiden as a caretaker (why, we don’t really know, other than just the novelty), Akbad uses magic wings to abduct Trot and take her to the serpent. These wings seem a bit arbitrary in how they operate; Akbad can use them to scare the Scarecrow and Benny, but later they don’t work at all when he wants to use them selfishly, even though his selfish goals would also benefit other people. Along those lines, it’s also never clear why the blue ray that turns people into shadows doesn’t work on Benny. Is it because of his solid construction, or his willpower? Also, if Akbad if supposed to be realistic, shouldn’t he realize that the mortals in the Emerald City might be under Ozma’s protection? 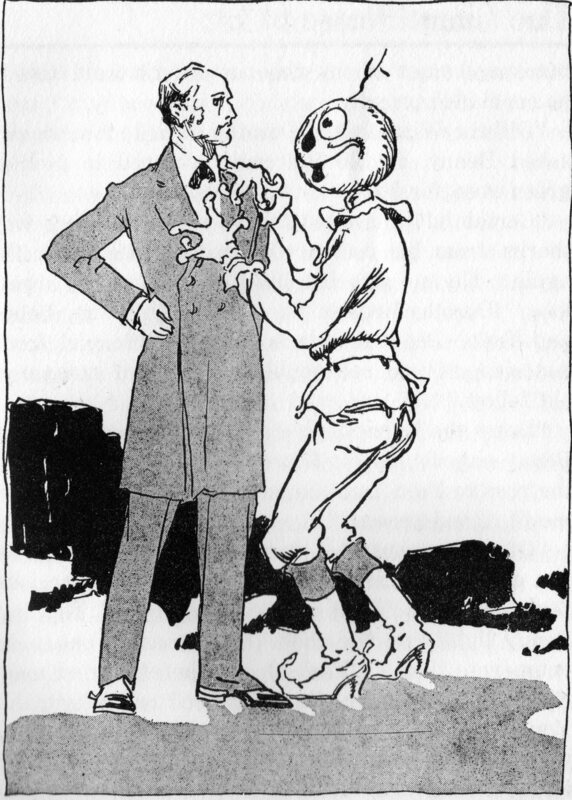 The character who does develop somewhat in this story is Benny, given that name by the Scarecrow because he’s the statue of a public benefactor, with the straw man as a mentor to teach him to recognize his own strengths instead of trying to be like other people. His coming to life and Oz are pretty rushed, and a literal reading seems to indicate that Oz is underneath Boston, which doesn’t fit with anything else in the series. Why he’s from Boston at all isn’t really clear as far as the plot goes, although his misadventures in the United States seem to borrow a lot from John Dough’s, including his obsession with fashion accessories. Herby the Medicine Man is a likeable character, although his habit of handing out pills for everything (anger, yawning, hunger, lack of sleep) is kind of disturbing in a modern context. And High Boy, alternately referred to as a Giant Horse or a High Horse (not sure why the non-punny one became the title) doesn’t have that much of a stake in the plot, but he takes charge of things and manages to get through the later part of the journey without much trouble, due to his extending legs. 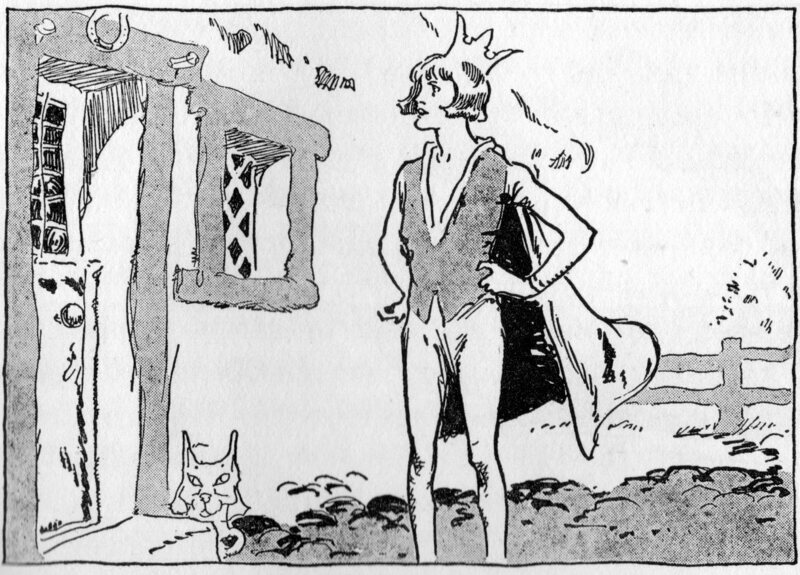 Another relevant character is the Good Witch of the North, here named Tattypoo (Thompson either wasn’t aware of or just ignored the name Locasta from the stage play), who is stated to be the ruler of the Gillikin Country in The Marvelous Land of Oz, but barely appears after that other than a brief role in Road. Thompson brought her back, but then immediately discarded her. There have been complaints about how she made the character younger, something she’d also do with one of her own characters in Yellow Knight, and suggesting some kind of issue with age. I wonder what her thoughts on the matter were once she grew old. I think this is the only time she totally changes an established L. Frank Baum character. There were other characters she wrote with noticeably different personalities (like the Tin Woodman) or expanded on their back stories (the Scarecrow and Ojo), but didn’t change them that much. But since Baum usually ignored the character, it’s not like it was a huge change in the grand scheme of things. I do think it’s kind of a shame not just because the original character had some potential, but also because Thompson gives her some interesting companions and magic. In order for the revelation about her to be a surprise, she disappears after being featured in a single chapter, then tells her back story at the end. Cheeriobed becomes King of the Munchkins, and Ozma appoints someone she presumably hasn’t met King of the Gillikins, and that situation remains in place until Neill starts mixing things up in his books. Any thoughts on my reviews of the original Oz books? They feel a bit redundant, as I’ve read all of these books many times, and discussed just about every element of them over the years. What I haven’t done so much is look at them as individual books. This entry was posted in Book Reviews, Characters, John R. Neill, L. Frank Baum, Magic, Magic Items, Monsters, Oz, Oz Authors, Ruth Plumly Thompson and tagged akbad, benny, captain salt in oz, coming of age, evered of rash, good witch of the north, grampa in oz, high boy, kabumpo in oz, king cheeriobed, king randywell, ozma, ozure isles, prince philador, prince pompadore, prince tatters, queen orin, quiberon, scarecrow, tazander tazah of ozamaland, the giant horse of oz, the hungry tiger of oz, the marvelous land of oz, the purple prince of oz, the road to oz, the silver princess in oz, trot griffiths, wizard of oz. Bookmark the permalink.